Special Containment Procedures: SCP-3401 is contained in a standard anomalous item locker. 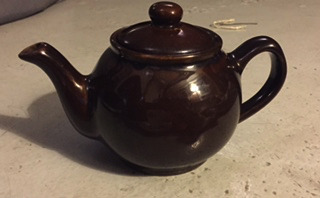 Description: SCP-3401 is a brown clay teapot, measuring 11cm in height and 17cm in length. The bottom of SCP-3401 bears the inscription 'A lasting memento for any tea lover'. SCP-3401's anomalous effects manifest when a small portion of human ash, approximately a single teaspoon, is placed into SCP-3401 and then filled with boiled water. Ashes placed inside SCP-3401 will then begin to infuse with the boiled water in a manner consistent to fermented tea leaves. The water will initially experience a change in color and gain a particular scent depending on the ashes. After 2-3 minutes, the water inside SCP-3401 will take a quasi-liquid form, coated in a thin clear membrane consistent with vegetable oil. In this state, the resulting ‘brew’ will resemble a miniaturized limp human body, resembling the individual whose ashes were used (SCP-3401-1). SCP-3401-1 instances are intricately detailed, portraying minor features of the individual, such as finger/toenails, hair and wrinkles. SCP-3401-1 will behave partly as a single liquid mass, separating only when manipulated feasibly by exterior sources. Closer examination of SCP-3401-1 instances reveals a faint sound emanating from them, similar to a heartbeat. SCP-3401-1 may be drunk and is often described as having a consistency similar to hot tea and watery jelly. SCP-3401-1 each have their own distinguishing taste depending on the ashes used and are usually a complex mixture of flavours; including ones not limited to average tea. In all cases, SCP-3401-1 instances have been reported as also having a flavor bearing similarities to the respective person's cause of death1 (a list of reported flavors can be found below). A mixture of ashes to brew SCP-3401-1 is possible; however, the produced instance will appear as a physically deformed fusion of the respected bodies and is described as tasting of blood and various other bodily fluids. 23 year old female Allergic reaction (bee sting) Sweet with a strong cherry zest and spice. Faint taste of freshly cut grass and honey. 42 year old man Homicide Aromatic, rich, bergamot orange. Hint of sweat, blood, metal and perfume. 14 year old male Reported accidental death (falling)3 Sweet with a flavor of vanilla and candied nuts. Slight hint of arsenic. 93 year old male Lung cancer Non-anomalous pure green tea (SCP-3401-1 was not produced). 1. Allergic reaction to almonds: slight nutty taste, death by burning: smokey, drowning: sea air and fish, homicide: decaying wood, iron and compost. 2. Subjects reported a significant mood increase after drinking. Reports showed subjects to have experienced a considerable release of dopamine.